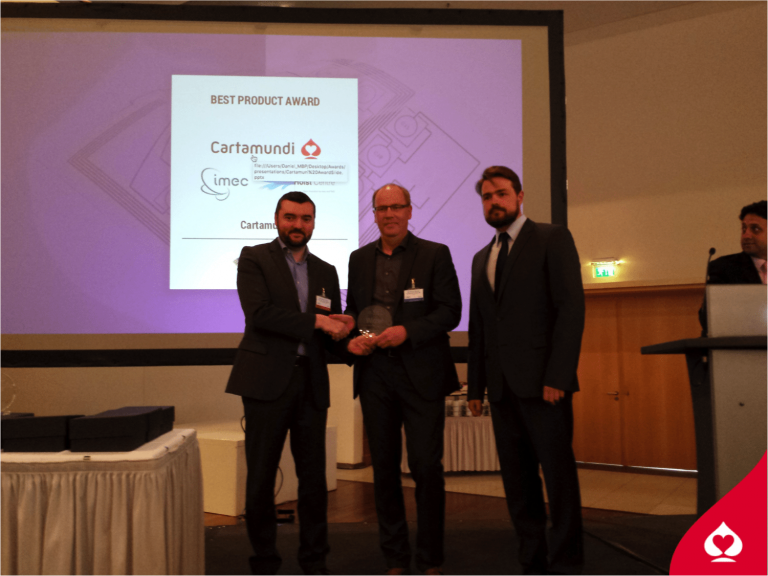 Cartamundi, imec and Holst Centre (set up by imec and TNO) are proud to announce to have just won the “Best Product” - Award at Printed Electronics Europe for their ultra-thin plastic RFID technology integrated into Cartamundi’s playing cards. The jury has hereby recognized the potential of this technology to become a gamechanger for the gaming industry, as well as for many other printed electronics applications in the Internet-of-Things domain. With economic and form-factor advantages compared to traditional silicon-based technologies, Holst Centre’s and imec’s ultra-thin plastic RFID solution is essential to improve and broaden the applicability of electronics seamlessly integrated in paper. This enables Cartamundi to develop connected devices with additional value and content for consumers. At the conference, Cartamundi, imec and Holst Centre demonstrate an industry-first prototype of the ultra-thin flexible RFID chip integrated into a playing card. In each card, the RFID chip has a unique code that communicates wirelessly to an RFID reader, giving the cards in the game a unique digital identity. Imec and Cartamundi engineers will now explore up-scaling of the technology using a foundry production model. This award would not have been possible without the support and advise of VLAIO. VLAIO played a substantial role by bringing all partners of the project together. Imec performs world-leading research in nanoelectronics and photovoltaics. Imec leverages its scientific knowledge with the innovative power of its global partnerships in ICT, healthcare and energy. Imec delivers industry-relevant technology solutions. In a unique high-tech environment, its international top talent is committed to providing the building blocks for a better life in a sustainable society. Imec is headquartered in Leuven, Belgium, and has offices in Belgium, the Netherlands, Taiwan, USA, China, India and Japan. Its staff of more than 2,400 people includes about 740 industrial residents and guest researchers. In 2015, imec’s revenue (P&L) totaled 415 million euro. Further information on imec can be found at www.imec.be. Stay up to date about what’s happening at imec with the monthly imec magazine, available for tablets and smartphones (as an app for iOS and Android), or via the website www.imec.be. Cartamundi became the world’s leading game manufacturer. The Cartamundi group now has a workforce of 2,060 with factories in Belgium, Germany, France, UK, Ireland, Poland, USA, Brazil, Mexico, India and Japan, and 14 sales offices worldwide. In 2008, the company was awarded the accolade of Entrepreneur of the Year. This year Cartamundi received the Company of the Year Award from the Belgian-American Chamber of Commerce. The purpose of Cartamundi is “sharing the magic of playing together”.